Research shows that growth fueled through organic innovation is more profitable than growth driven by acquisition, in part because the organizational capability required is vastly different. But the litmus test is: How can established organizations build successful new businesses through corporate entrepreneurship, also referred to as Intrapreneurship, on an ongoing basis? This is also one of the key questions that companies we’ve been working with are raising more frequently. First, let’s be clear on what Intrapreneurship actually means. According to Robert C. Wolcott and Michael J. Lippitz the term is defined as the process by which teams within an established company conceive, foster, launch and manage a new business that is distinct from the parent company but leverages the parent’s assets, market position, capabilities or other resources. It differs from corporate venture capital, which predominantly pursues financial investments in external companies. Although it often involves external partners and capabilities (including acquisitions), it engages significant resources of the established company, and internal teams typically manage projects. It’s also different from spinouts, which are generally constructed as stand-alone enterprises that do not require continuous leveraging of current business activities to realize their potential. Which model proves well-suited and is to be selected strongly depends on the questions: Which purpose and objectives are to be pursued by implementing an intrapreneurship model in the company? Is it geared towards nurturing companywide cultural change, reshaping a particular business division or exploring cross-company, occasionally even disruptive, opportunities. Enabler programs can support efforts to enhance a company’s culture. When an organization already enjoys substantial collaboration and ideation at the grassroots level, the enabler model can provide clear channels for concepts to be considered and funded. For companies seeking cultural transformation, enabler processes in combination with new hiring criteria and staff development can result in a number of employees becoming effective change agents. The enabler model is particularly well-suited to environments in which concept development and experimentation can be pursued economically throughout the organization. For companies that want to accelerate the growth of established divisions, the advocate model might be the best option. Because of the limited resources of this model, managers must tailor their initiatives to the interests of existing lines of business, and employees have to collaborate intensively throughout the organization. This enhances the potential fit of opportunities to a company’s operations, but also requires leadership to ensure that projects do not become too incremental. Advocates exist to help business units do what they can’t accomplish on their own but should pursue in order to remain vital and relevant. 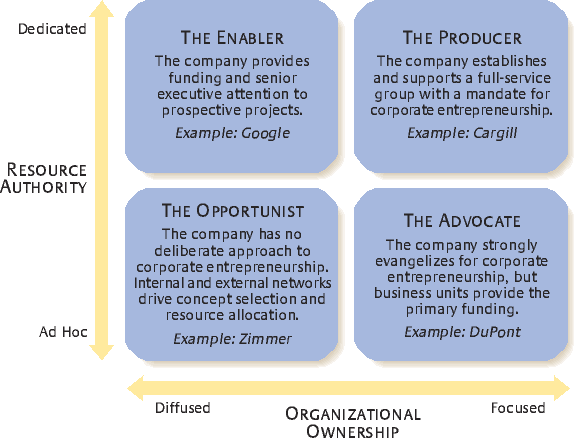 Moreover, the advocate model (as well as the producer model) can prevent corporate entrepreneurship from becoming a casualty of powerful business units or competing silos. If a company seeks to conquer new growth domains, discover breakthrough opportunities or thwart potentially disruptive competition, then it should consider the producer model. In general, business units are not likely to pursue disruptive concepts, and they often face strong near-term pressures that discourage investments in new growth platforms. The producer model helps overcome this, and it can provide the necessary coordination for initiatives that involve complex technologies or require the integration of certain capabilities across different business units. Each of the models requires different forms of leadership, processes and skill sets. An enabler model depends on establishing and communicating simple, clear processes for selecting projects, allocating funds and tracking progress, all with well-defined executive involvement. Advocate models require individuals with the instincts, access and talent to navigate the corporate culture and facilitate change. Leading advocate organizations build an arsenal of facilitation methodologies, new business design tools and networks with external capabilities. The producer model requires considerable capital and staffing and a direct line to top management. Understaffed, part-time or underfunded producer teams are set to fail. As the three of them turn out largely complementary, this suggests considering putting those models in place concurrently on the part of most organizations – in order to stimulate the highest impact on internal innovation capabilities.